Rwanda’s President Paul Kagame arrived in Casablanca on Monday on a two-day official visit to Morocco. The Rwandan head of state was welcomed by King Mohammed VI at an official ceremony at the Royal Palace in Casablanca. The Moroccan Sovereign will hold talks with his African guest and will host an official iftar in his honor, says the Ministry of the Royal Household, Protocol and Chancellery. This is Paul Kagame’s first official visit in Morocco. In November 2015, the Rwandan President had participated in Tangiers in MEDAYS, a forum organized by the Moroccan Amadeus Institute. Paul Kagame was then awarded the Grand Prix in recognition of his endeavors to promote education and health. 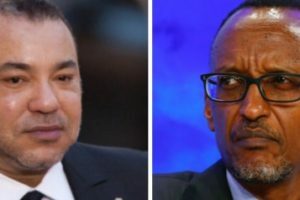 This first official visit to Morocco by the Rwandan President reflects the two countries’ desire to boost their relations and will surely open up a new chapter in their political and economic relations and enhance their partnership within the frame of a win-win South-South cooperation. King Mohammed VI has made of partnership with other African countries a strategic component of Moroccan diplomacy in Africa and has tirelessly endeavored to promote south-south cooperation. The opening of Morocco onto East African countries falls in line with this African policy spearheaded by Mohammed VI. Banking on its strong political, economic and trade partnership with West and Central African countries, Morocco is currently endeavoring to expand its sphere of influence to the eastern parts of Africa. Now, Rwanda appears to be the best spot wherefrom to lead this breakthrough in East Africa and with English-speaking countries especially that both countries have initiated sound economic reforms and that both countries support South-South partnership to break away from the yoke of the former colonial powers. Posted by Pawla Nibramich on June 20, 2016. Filed under News. You can follow any responses to this entry through the RSS 2.0. You can skip to the end and leave a response. Pinging is currently not allowed.